Czech-born artist Klara Hobza has one foot firmly planted in the past; the other, equally firmly placed in the future. 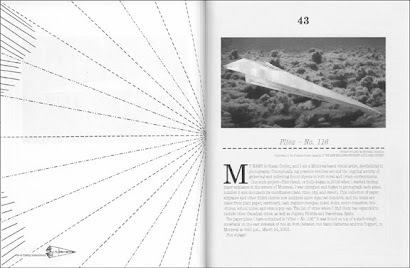 …a collection of some of the artist’s favorite paper airplanes and stories by their creators, gathered from The New Millennium Paper Airplane Contest exhibition, held at the New York Hall of Science in Queens, New York, in 2008. This project was itself an homage to the historic paper airplane contest that took place in 1967 at the same venue–which, in a note of minor irony, was built to display rockets for the 1964 World’s Fair. The competition was open to the public, and participants were invited to fly their planes in a number of judging categories including distance flown, duration aloft, beauty, spectacular failure and children’s designs. Each page is designed to be torn out and folded into the flyer that it describes (and– for those, like your correspondent, needing a little extra help– a complete list of step-by-step folding instructions is included). As we concentrate on the optimal point of release, we might look spare a commemorative second to look down, as it was on this date in 1776 that the first submarine attack occurred. 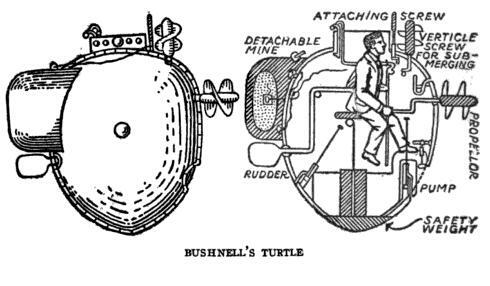 In anticipation of the Battle of Kips Bay, the Turtle— a hand-powered, egg-shaped submersible designed by David Bushnell– tried and failed to sink the British warship HMS Eagle, flagship of the blockaders in New York harbor; the explosives attached to the Eagle‘s hull weren’t sufficient to tank it. Still, the mission was a success: the mysterious blast in the night frightened the British, and they withdrew almost immediately.